Learn how to make the most out of your apartment kitchen! 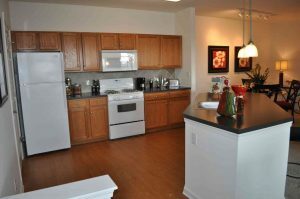 Apartment rentals are known to have smaller kitchens than homes, even if you live in a luxury apartment complex. Small kitchens can be difficult to get used to, especially ones with limited counter space. Continue reading to learn how to get the most out of your apartment kitchen and maximize the space! If your kitchen comes with tall cabinets with only one shelf, add your own shelves to use all the extra vertical space! Renters don’t have the option to reconstruct their cabinets, but there are many shelves on the market that are very easy to add without causing any damage to the existing cabinets. Make sure you find durable shelves to ensure your items are safe and secure. If you need even more room, you may be able to store items on the inside of your cabinet doors. Once again, this doesn’t damage the cabinets, as you can mount small shelves or use command hooks to hang pot lids without any tools. Limited counter space is a common complaint in small apartment kitchens, and renters have trouble finding the space for cooking prep work. If you’re short on counter space, try an over-the-sink cutting board for meal prepping. This little trick will save you the hassle of clearing your counters while making clean up even easier. If you need more storage for all your kitchen appliances, think about buying a rolling cart. These come in all shapes and sizes, and at a wide price range, so you can find the perfect size cart that fits your kitchen and your budget. Even if you don’t have room to leave the cart out at all time, store it under the counter or in another room as storage for items you don’t use every day. Are you out of cabinet space, but have plenty of space above the cabinets? Try a hanging pot rack for your ceiling! The pot racks allow you to keep pots and pans out of the way until they’re needed while creating a great decoration conversation piece. If your apartment has tall ceilings that are out of your reach, modify the idea by hanging pots and pans on pegboards on the sides of your cabinets or on the wall. This entry was posted on Friday, March 9th, 2018	at 3:24 pm	. Both comments and pings are currently closed.